If you haven't read How I Met Your Mother My Fiancé, do that first! Earlier in the week (I think Monday or Tuesday) Dan asked me if we could have a date night after my shift on Friday. Sounded good to me. I was a little suspicious, because as I mentioned in my last post, our first date was on a Friday night after my evening shift too. So Friday afternoon I went off to work. 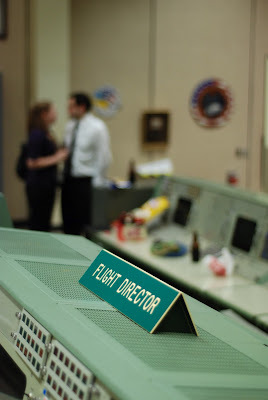 Dan employed some misdirection, telling me it wasn't a date really and that I could invite the rest of the flight control team, if people wanted to go out after the shift. Then, when I texted to tell him that handover was starting which meant I was almost done, he went from slightly sneaky to extremely shady. He asked me to go upstairs to the historic Apollo mission control room to "do something" for him. Now extremely suspicious, I decided not to test his lying powers and just let him have that one. I got out of work, headed upstairs, and there he was! So, ok, I wasn't really surprised that he was there. What exactly was I going to do for him upstairs, at midnight, if this wasn't it? There he is, texting me from one floor up. Liar. But I was still a little shocked that it was actually happening and I went into a bit of sensory overload. I noticed his helpers- Jen and Shawn. That was unexpected, since I had also talked to Jen earlier in my shift. She works in my group and was my on-call power analyst for the night and had called to ask about a potential Debris Avoidance Maneuver we might have to plan. While on the phone she also employed some misdirection that I didn't catch (because I didn't guess she would be in on it). Her husband Shawn has a fancy camera and is responsible for all these pretty pictures. "Stephanie, you know I love you." 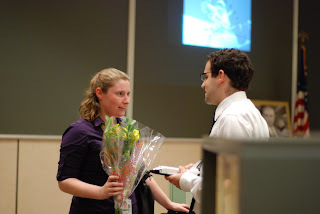 "Yeah..."
So he handed me a bouquet of flowers and told me he loved me. 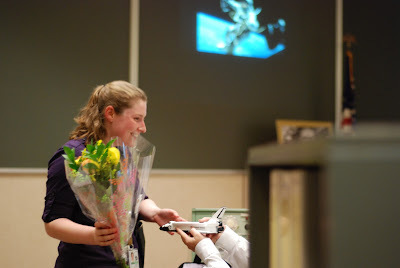 Then he got down on one knee and popped open a little plastic space shuttle model, which had the ring inside. 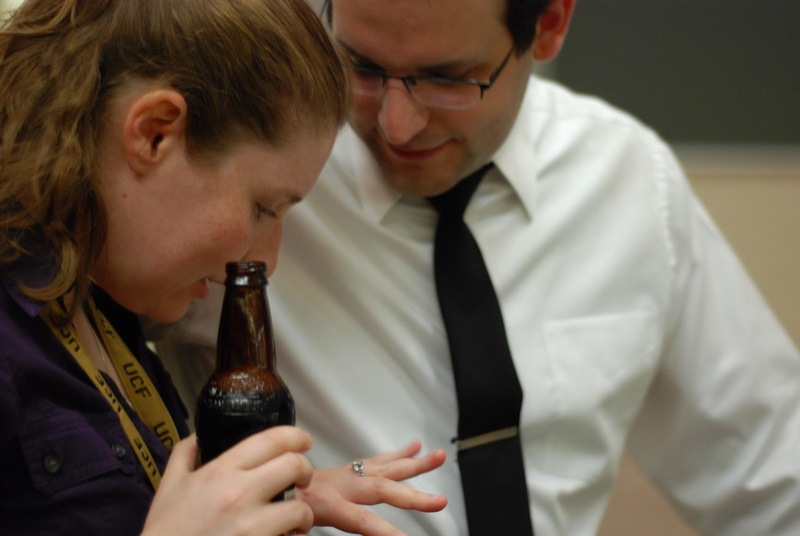 Still overwhelmed, I just nodded and he handed me the ring to put on. I spent a lot of the next few minutes staring at my hand. Then I started to notice other details. Dan was dressed in a white shirt and skinny black tie, just like the Apollo flight controllers used to. 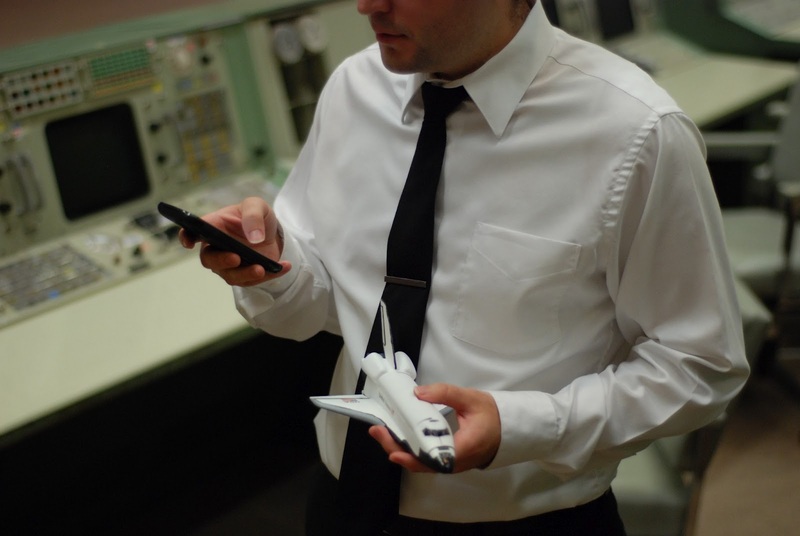 The space shuttle model was hand built and painted, and he had made some modifications to it to hold the ring inside. And the best part... 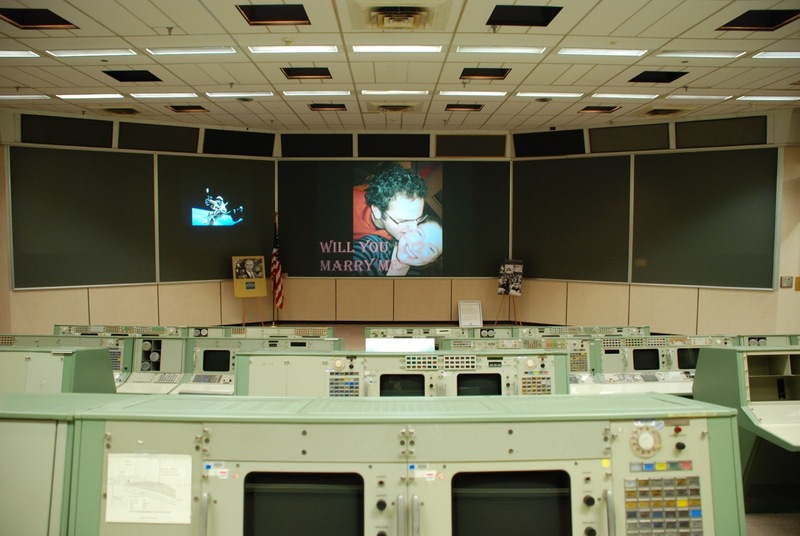 The screen in the Apollo room usually plays a slideshow of moon landing pictures and related Apollo snapshots. 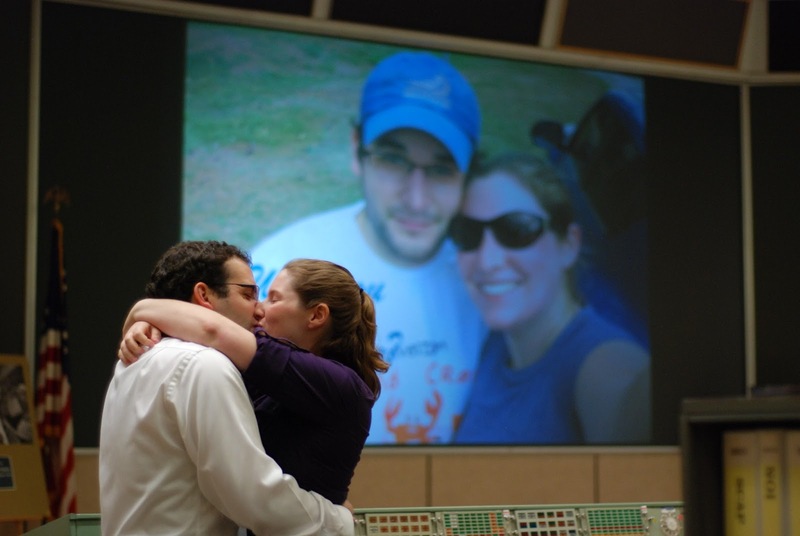 But he had gotten someone to put on a slideshow of pictures of us. So cool! 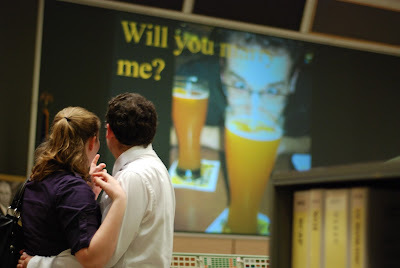 Every slide said 'Will you marry me?" "Did you steal all these from my blog?" Jen brought root beer (couldn't very well drink real alcohol at work) and we hung out and drank as I picked up all the little details and stared at my hand a little more. Its so shiny! Then Jen and Shawn had to get home so they could run Warrior Dash today. Since I was at work and a couple of my friends were on console, I stopped in the current mission control room (which I had just left half and hour before) to show off my bling. Then Dan and I headed out to a bar and had a drink while we texted everyone. It was after midnight in Houston, which means after 1am where most of our family and friends live on the east coast. We got in touch with a few people and had a ceremonial Facebook-status changing. We are big nerds. If that was not overwhelmingly obvious. I know he couldn't make it a total surprise, but I am still shocked and amazed at all the planning and orchestrating, and little touches he pulled off. That room has so much history. It's the room they controlled Apollo 11 from, the first moon landing. And it's the room where I said yes. I wonder if any other NASA nerd couples have gotten engaged in that same room, or if we are the first. My friend Sarah says "Where's the ring? There're no pictures of the ring!"